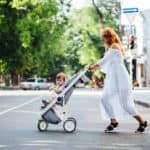 Mia Moda Compagno Stroller Review - Is It Worth The Money? I believe that form is as important as its function, and many moms feel the same way. If you believe this as well, then you might want to set your sights on Mia Moda for a few moments. With European style and trend setting designs, the Mia Moda Compagno stroller is a real head turner. It has that sophisticated design that many fashion-forward moms love. Even dads love the cool design of the Compagno, and it is available in five striking color schemes. Large Storage Basket Universal Car Seat Adaptor for use with most major Infant Car Seats"
Mia Moda’s version of the stand-on stroller, also known as a sit and stand or stroller-and-a-half, is called the Compagno. It’s the perfect stroller for you if you have an older child who is 2½ years or older and a younger baby or one on the way. 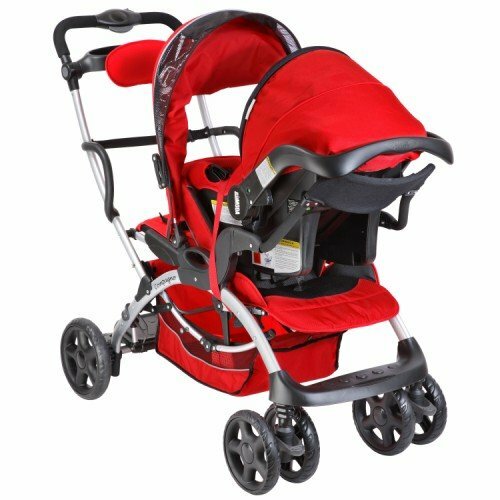 The Mia Moda Compagno has earned high praise from parents who enjoy the excellent maneuverability and ease of use. By the time you finish reading this review, you will learn how the other outstanding and unique features can help you have pleasant outings with your two children. Let’s get started with quick run-down of the features. 11 Where can I buy the Mia Moda Compagno? The Mia Moda Compagno can hold your newborn baby in an infant car seat as part of a travel system in the front seat. The Compango accommodates most major brands with a universal adapter. Because the seat does not recline completely, your baby should be at least six months old before riding in the front seat without the car seat attachment. With its all-wheel suspension, the Mia Moda Compagno delivers a smooth ride and the swivel wheels are highly maneuverable. In various reviews, parents have praised the stroller for being very easy to push and steer while having two kids on board. They also mentioned that the Compagno is great for strolling at malls, amusement parks, museums, as well as playgrounds. The Mia Moda Compagno is a very sturdy stroller because the frame is made of heady duty steel and has an 85-pound weight capacity, with 40 pounds for the front seat and 45 pounds in the rear platform/bench. The stroller weighs about 34½ pounds, which is heavy but it is expected from such a sturdy and strong stand-on stroller. Despite its weight, parents have mentioned in reviews that it is not much of a problem. The Mia Moda Compagno folds up in a convenient standing position and unfolds in two easy steps. A standing fold is one of the best ways to store your stroller in a closet or garage. I like that it comes from the manufacturer almost fully assembled, which is a plus point for busy parents and excited kids. The Compango also fits into small car trunks without many complications, although you may need to remove its canopy beforehand. The Mia Moda Compagno is super comfortable. One happy mom said in a review that her kids enjoy strolls even more, now that they have the Compagno. It has spacious seats for both kids, and she said that whenever her toddler is tired of walking, he will climb onto the rear seat on his own. The Compagno has a standing board for the older child, in addition to the seat, and both the front seat and back bench are padded and plush. I really like the next feature, as it is unique that I haven’t seen on other sit and stand strollers. The handle bar has a resting pad for your older child as he or she leans back, which provides additional support and balance. The sun canopy has a peek-a-boo window and also a sun visor. 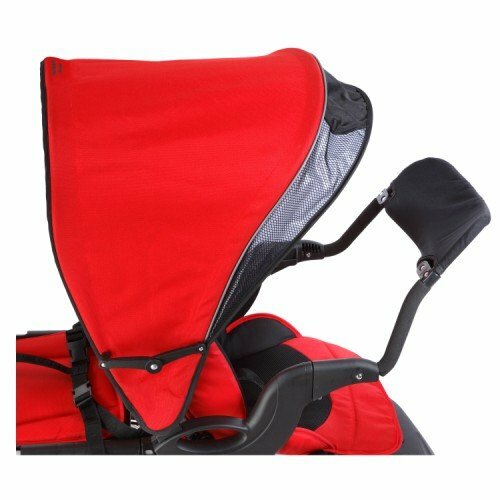 The canopy protects your child that sits in front, but the child in the back will need additional protection like a hat and long sleeves because the canopy does not extend far enough. Another mom said that she loves the Compagno’s harness because it snaps much easier than the harness on her previous stroller. The Mia Moda Compagno has 5-point safety harnesses that are also padded like the seats. There are gripping handles for your child in the back to grab and hold onto for more security. The Compagno is a very sturdy and stable stand-on stroller, which I think is very important when you’re hauling the weight of two growing kids. According to a parent’s review, it does not tip forward, unlike some other brands of tandem or sit and stand strollers. 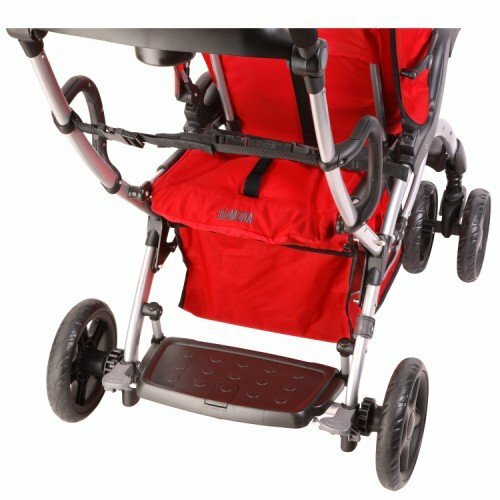 With a one-touch rear brake on the Mia Moda Compagno sit and stand stroller, you only need to push the brake pedal down on one side for both to engage. Folded: 20.7″H x 25¼”W x 43.7″LWidth: 25¼”Length: 39½”Handle height: 47″Front Seat: Age: 6 months+max. 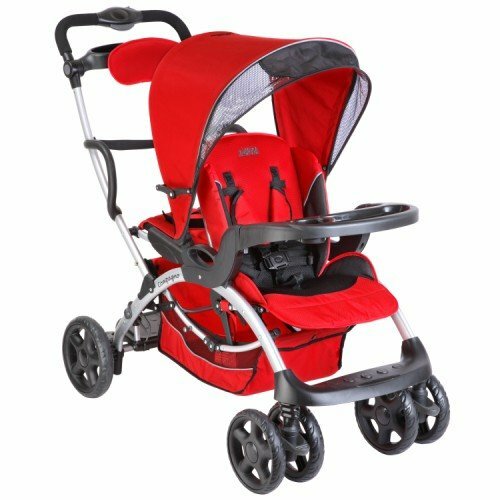 weight: 40 lbs.Rear Seat & Platform: max weight: 45 lbs.Stroller Weight: 34½lbs. The storage basket has ample space underneath the seat, but you may experience difficulty accessing the basket when your kids are on the stroller. Simply have your older one stand up because the bench flips up and you can get to the basket that way. Many other tandem strollers do not come with parent tray, but the Mia Moda Compagno has a parent tray with cup holder. This is an excellent feature for parents who need their beverage of choice while running errands with their kids. The parent tray is also a great space for items like cell phones and keys. 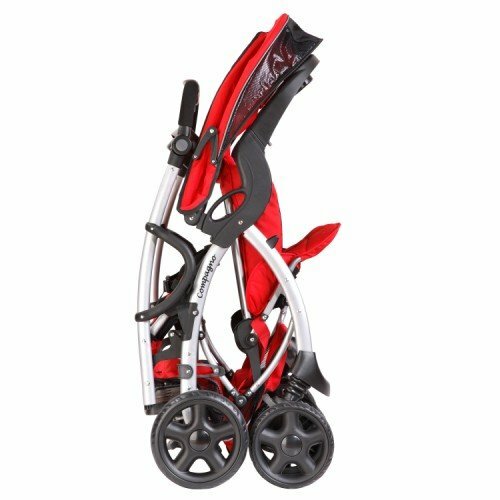 The handlebar is adjustable too, so whether you’re not the tallest mom around or you like to let your older kid help push, you can find a height that is comfortable and won’t kick the back as you walk. Moms say that this stroller is perfect for going from rough natural trails to cracked city streets. Parents rave about the how easy the turning is because the center of gravity is well-centered and that it can be easier to push than a single stroller.Parents also love how stylist the Compagno is. There are plenty of things to enjoy about this stroller. Many parents have mentioned how easy it is store in their car trunks. Moms mention how much their older children love the freedom of getting in and out on their own. It makes them feel like big boys and girls! The canopy does not shade both children and there are several complaints about it being inadequate. When the front seat is reclined, it gets in the way of the older child sitting on the bench. The older child has to stand up if the younger one needs to lie down. It is a bit heavy for many Compagno owners, but consider how sturdy it is. Where can I buy the Mia Moda Compagno? My favorite place to buy strollers and find excellent deals on them is on Amazon Prices are extremely competitive and you get prompt service. In my opinion, you cannot go wrong.